128North to 95North to Route 1North (Route 1 is exit 50 off of 95 )Follow Route 1 for approximately 6 miles to the intersection with Route 133. Turn right onto Route 133East (133 is Haverhill Street) After 1/10 mile, look for a black sign on the left “The Market Place” Turn left into the market place. Blue Basil will be up on the left hand side at the far end of the building. Green awnings with Blue Basil over front door. Route 95North to Exit 54A (Route 133East toward Rowley) Follow 133 for approximately 3 miles to the intersection with Route 1. Continue on 133East across Route 1. After 1/10 mile, look for a black sign on the left “The Market Place” Turn left into the market place. Blue Basil will be up on the left hand side at the far end of the building. Green awnings with Blue Basil over front door. 95South to exit 54A (Route 133East toward Rowley) Follow 133 for approximately 3 miles to the intersection with Route 1. Continue on 133East across Route 1. After 1/10 mile, look for a black sign on the left “The Market Place” Turn left into the market place. Blue Basil will be up on the left hand side at the far end of the building. Green awnings with Blue Basil over front door. Route 1South to the intersection with Route 133. Turn left onto Route 133East After 1/10 mile, look for a black sign on the left “The Market Place” Turn left into the market place. Blue Basil will be up on the left hand side at the far end of the building. Green awnings with Blue Basil over front door. Route 133East all the way to the intersection with Route 1. Continue on 133East across Route 1. After 1/10 mile, look for a black sign on the left “The Market Place” Turn left into the market place. Blue Basil will be up on the left hand side at the far end of the building. Green awnings with Blue Basil over front door. Route 1A to Route 133West. Once on Route 133West, after 2 miles, look for a black sign on the right “The Market Place” Turn right into the market place. Blue Basil will be up on the left hand side at the far end of the building. 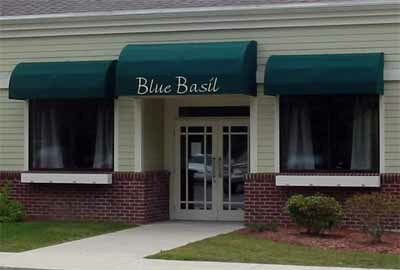 Green awnings with Blue Basil over front door.